Signing an agreement on the side-lines of the high-level event on Food and Agriculture in Times of Crises, the Food and Agriculture Organisation of the United Nations (FAO) and the Africa-Europe Diaspora Development Platform (ADEPT) have joined efforts to enhance the positive contribution of migration to the areas of agricultural and rural development. "We tend to underestimate the power of the diaspora in peace, development, humanitarian and, of course, around migration issues. We are signing this Memmorandum of Understanding with ADEPT today to work more closely together and give visibility to the potential diaspora holds, but also to what is already happening with diaspora communities," said FAO deputy director-general Daniel Gustafson. 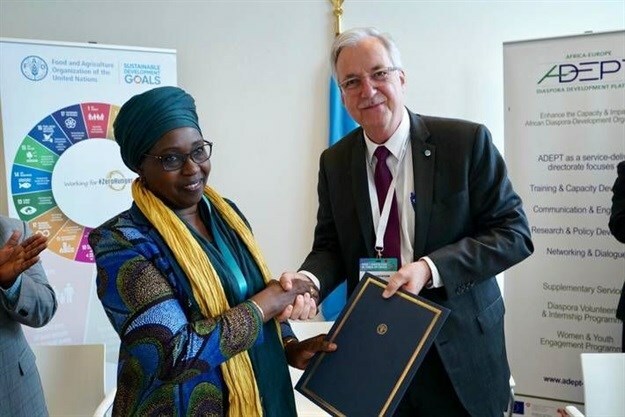 ADEPT president Khady Sakho Niang, who signed the agreement on behalf of her organisation, said: "Migration is a development driver generating positive change at the local and international level. The African diaspora is one of the key actors of this process, bringing about financial, intellectual and social contribution. We hope the FAO-ADEPT cooperation will enable us to join energies, knowledge, networks and expertise in two interlinked areas, migration and agriculture, for the benefit of the African people and continent." ADEPT, an international non-profit based in Belgium, supports and empowers African diaspora development organisations based within the European Union, Norway and Switzerland. While helping to formally involve African diaspora groups in development processes in Africa, it also serves as a point of reference for those interested in African development issues, migration and development policy. Migration is closely linked to FAO's goals of fighting hunger, achieving food security, reducing rural poverty and promoting the sustainable use of natural resources. FAO's expertise in the areas of capacity development, policy support to governments and rural institutions, agribusiness, value chain and food system development naturally complements ADEPT's experience in engaging diaspora organisations around migration-related issues. FAO and ADEPT plan to work jointly to promote awareness of the nexus of migration, agriculture and rural development, and the opportunities associated with rural migration. The organisations will also combine their technical knowledge and capacity to increase diaspora engagement, focusing on agribusiness and resource mobilisation. The activities of the partnership will contribute to the achievement of several Sustainable Development Goals (SDGs), principally Goal 2: Zero Hunger, Goal 8: Promote inclusive and sustainable economic growth, employment and decent work for all, Goal 10: Reduce inequality within and among countries and Goal 17: Revitalising global partnerships for sustainable development.